17 August – Report from Anarchist Affinity members who were supporting the MLDC (Melbourne Liquor Distribution Centre) strike last week. Workers at Woolworths MLDC launched unprotected (unlawful) strike action in the early hours of Monday morning last week. 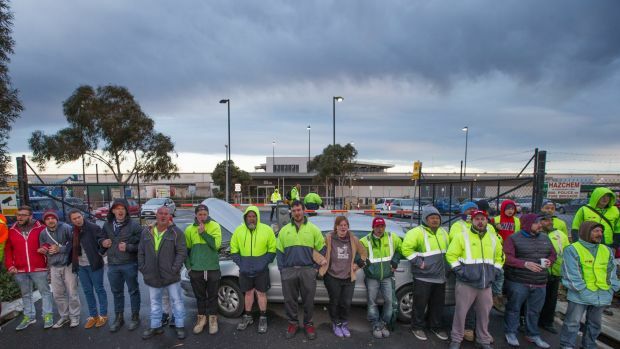 Workers were responding to broken promises by management; Woolworths management had announced the week before that all new hires at the Laverton site would be through a labour-hire agency despite promises to the contrary made in EBA negotiations less than a year earlier. The MLDC strike was called for, planned and hastily executed by rank and file union militants at MLDC. The decision to strike occurred to the genuine surprise of NUW union organisers and officials (the NUW is the workers’ union), and this decision was taken by a workforce who had never previously been on strike together. The MLDC sits at a critical juncture in Woolworth’s supply chain. The strike shut-down liquor and cigarette supplies to Woolworths, BWS and Dan Murphy’s stores across Victoria. On day four of the strike, industrial action occurred at two other Woolworth’s distribution centres in Hume and Barnawatha. The Hume DC afternoon shift joined the strike and the Barnawatha DC imposed an overtime ban whilst planning to join the strike. This strike action continued despite the threat of fines and dismissal. It continued in defiance of an order by the Fair Work Commission on Tuesday. When ordered back to work, strikers at MLDC burnt copies of the FWC order and announced they would not return to work until Woolworths agreed “no labour hire and no repercussions [for striking]”. The power that these workers held in their hands was palpable. A number of us in Anarchist Affinity are NUW members and delegates (in the market research industry); we headed down to MLDC and joined the picket as part of a larger community support contingent. It was with disgust that from here we watched NUW hierarchy sell the workers at MLDC short. Why NUW leadership acted in this manner is a matter for debate, it could simply have been timidity in the face of potential fines, or perhaps a fear of an industrial situation escalating outside their control. What is clear is that by late Wednesday NUW leadership had decided to intervene and end the MLDC strike. The process of undermining the strike began with a mass meeting on Thursday morning. NUW officials advised workers that a federal court injunction was coming that could not be defied. Workers were told that this injunction would result in fines of up to $10,000 and potentially jail time for the strikers. Union leaders claimed only way out was to authorise the leadership to negotiate a deal. Over the course of Thursday the strike was demobilised on the outside as officials cut a deal with the company inside. At the final mass meeting held at the picket on Thursday evening, union leadership presented the deal they had cut. They argued there was no alternative and called for workers to endorse it. The militants who had called the strike fought for a continuation, but ultimately lost in a vote split roughly 70-30. The compromise that was accepted will (in broad terms) see labour-hire on the site during ‘peak periods’, subject to certain restrictions. The most important restriction is that labor-hire workers will be paid site rates and covered by the site EBA. More concerningly, the union leadership agreed to a deal in which workers will face retribution for striking. All of the strikers will be subjected to ‘counseling’ and a six month written warning for unprotected action. The union and the company also intend to appoint an ‘independent investigator’ to ‘make recommendations’ about three particular workers for unspecified actions during the strike. The names of these three workers have not been disclosed, but it seems likely that strike organisers will face further retribution. The MLDC strike was nonetheless amazing. Workers without significant support from their union took militant industrial action for four days, defying one of Australia’s largest retailers and the misnamed Fair Work Commission. For a brief moment they held the profitability of one of Australia’s largest corporations to ransom. The MLDC strike may have accepted a compromise that in the end conceded labour-hire and disciplinary action for striking workers, but it also showed what is possible. The strike was one small but potent demonstration of the power that still exists on a picket line, and what even a small group of militants can achieve when they organise. Our solidarity, support and love go out to everyone we met on the picketlines at MLDC. 10 Aug – Protesting workers refuse to unload the first cargo ship to arrive at Hutchison Port operations since the company sacked 97 workers in Brisbane and Sydney via email and text message last week. Protesting workers have refused to unload the first cargo ship to arrive at Hutchison Port operations since the company sacked 97 workers in Brisbane and Sydney via email and text message last week. The ship Capitaine Tasman arrived at Port Botany in Sydney about 9:30am on Monday, but went back out to sea about an hour later still fully laden. Staff at the Port of Brisbane are blocking the road to Berth 11, where a ship was due to dock Monday morning but failed to arrive. Picket lines were drawn at ports in both cities after Hutchison Ports Australia axed staff in messages about 11:30pm last Thursday, citing substantial financial losses. Chanting demonstrators in Brisbane said the late night dismissals were disgraceful and un-Australian, and have vowed to continue the protest until the decision is reversed. At both sites, trucks turned around and left as soon as they saw the rallies, while protestors in Brisbane prevented cars from entering the area. Queensland Treasurer Curtis Pitt was not impressed by the midnight sackings. He visited the workers at the picket line on Monday afternoon. “Losing your job is hard enough, but to get sacked via text message in the middle of the night is a really bitter pill to swallow,” he said. The Fair Work Commission ordered striking workers back to work last Friday. Federal Employment Minister Eric Abetz told the Senate that workers should abide by that decision to prevent further disruption. “If you have an independent umpire, you have to accept their decisions, right, wrong or indifferent,” he said. The Maritime Union of Australia is fighting the sackings through Fair Work Australia and the courts. Bob Carnegie from the Maritime Union Australia (MUA) said his members were ready for a fight over the “horrific treatment of a group of average Australian workers”. “We will win this dispute because our resolve is stronger, our belief is total, we are the wronged party,” he said. “Hutchison have all the wealth in the world, Lee Karshing the major shareholder of HPH, is worth $46 billion, he’s the richest man in Asia. The workers are defying a Fair Work Commission order, issued on Friday evening, to return to work. But Mr Carnegie said they were acting on workplace safety concerns. “The members who are rostered on have gone to work … as a collective they have made the decision that when they walk into the terminal, that they would only work if they were offered a safe working environment, which it isn’t,” he said. “The company has hired [foreign] security guards on 457 visas that they brought in late at night over the water, not through the terminal … and they have no maritime industry security clearance cards. “It’s extraordinary … these people are allowed by Hutchison and the Federal Government to just break all those rules and regulations for the idea that they can somehow break the back of the trade union organisation on the Australian docks. Mr Carnegie said workers would only perform cargo care so that farmers and companies did not lose perishable stock.